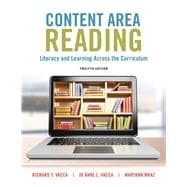 by Vacca, Richard T.; Vacca, Jo Anne L.; Mraz, Maryann E.
Widely popular as an undergraduate and graduate text and a valuable in-service resource, Content Area Reading shows pre- and in-service content area teachers how to use literacy-related instructional strategies to help students think and learn with all kinds of print and digital texts. As in previous editions, the emphasis is on the comprehensive content, including an ever-expanding knowledge base in the areas of literacy, cognition and learning, educational policy, new literacies and technologies, and student diversity. This edition updates readers with current theory, research, and practices related to content literacy and learning in disciplines. Throughout it includes a renewed focus on writing across the content areas, with emphasis on strategies for online writing and multimodal learning; new disciplinary literacy boxes throughout, new Voices from the Field boxes and new instructional strategy examples replacing those in older editions; updated content and references reflecting current developments in literacy education and content area reading; a new Key Learning Outcomes feature at the beginning of each chapter, and a new Check Your Understanding feature at the end of each chapter. A major update of Chapter 2, Learning with New Literacies, includes strategies to engage and empower multimodal learning across the curriculum. The Enhanced Pearson eText features embedded videos and assessments. Rich and Jo Anne Vacca are professors emeriti in the College of Education at Kent State University. Jo Anne taught language arts in middle schools in New York and Illinois and received her doctorate from Boston University. Rich taught high school English in New York and earned his doctorate at Syracuse University. He is a past president of the International Reading Association. The Vaccas have written numerous books and scholarly articles including Reading and Learning to Read, 8th Edition; Whole Language in Middle and Secondary Classrooms; and Case Studies in Whole Language. Rich also has served as a co-author of Elements of Literature and Elements of Language, both widely used in middle and secondary school English/language arts classrooms. Maryann Mraz, Ph.D. is a Professor in the Department of Reading and Elementary Education at the University of North Carolina at Charlotte. She earned her Ph.D. from Kent State University under the guidance of Jo Anne and Rich Vacca. Maryann is a former board member of the Association of Literacy Educators and Researchers (ALER) and the author of over 60 books, chapters, articles, and instructional materials on literacy education including co-authored books The Literacy Coach’s Companion and Independent Reading. She teaches literacy courses across masters and doctoral programs in the College of Education at UNC Charlotte.